Edinburgh, Indiana (06/05/13) – Chad Stapleton and good friend, Bub McCool, are once again teaming up for the 19th Annual Dirt Late Model Dream this weekend at Eldora Speedway (Rossburg, Ohio), and the team’s entry will carry a special Schaeffer Oil graphic’s scheme. After qualifying for the World 100 last year in a Chad Stapleton prepared Rightway Construction/Barry Wright/Jay Dickens Racing Engine Super Late Model Bub McCool will again pilot an entry for the team in this weekend’s 19th Annual Dirt Late Model Dream. Not only good friends, Stapleton and McCool, will come together to chase the weekend’s big payday, but both will also pay homage to one of their big sponsors. 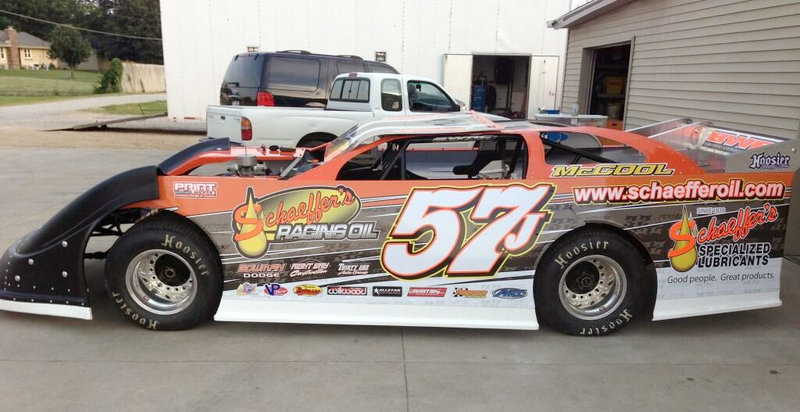 The car will carry McCool’s customary #57J on the door with giant Schaeffer’s logos positioned on the entry. Chad Stapleton would like to thank all of his sponsors and supporters including Rightway Construction, Skeletor Core, K&L Machining, Thirty-one Auto Group, Bowman Dodge, Cox Tree Service, Dirt Racing Connection, Schaeffer's Specialized Lubricants, Hoosier Race Tire, Jones Core, Roger's Bar, Barry Wright Race Cars, Tri County Auto Parts, Jay Dickens Racing Engines DK Designs, Rhino Linings, GW Performance, All Star Performance, Tranter Racing, AFCO, Frankland, Sweet Mfg, Outlaw, Wilwood, Team Peterson, VP Racing Fuels, and MSR Mafia Marketing Services. For the latest information on Chad Stapleton, please visit www.ChadStapleton.com.